The pioneering efforts of Mitchell Energy in the early 80’s made this play possible. While drilling for conventional oil and gas resources, geologists and engineers began looking at the Barnett Shale and saw similarities to the productive Devonian shales in the Appalachian Basin. After several fracture attempts that resulted in minor gas flows, the interval was stimulated with 210,000 pounds of sand and Slay #1 was completed as the first Barnett gas well. Between 1981 and 1989, only 66 wells were drilled to evaluate the Barnett. Early stimulation used in these wells progressed from small CO2 or N2 fracture treatments to large gel fracs consisting of 400,000 gallons of water and 1,250,000 pounds of sand. This system had a theoretical half-frac length of 450 m. The results were variable with wells producing up to 1 Bcf (28 MMm3) ultimate recovery. According to Bill Grieser of Halliburton: “At first we were concerned about using fresh water in a shale formation. Everything we had learned up to that time was that shales and water do not mix; we assumed all shales were alike. Now, we are finding out that every shale is unique”. Early in 1997, Mitchell Energy tried the first “slick-water frac” in the Barnett also called a light sand frac (LSF) that used 800,000 gallons of water along with 200,000 pounds of sand. This style of frac was borrowed from similar style jobs which were starting to be used in the Cotton Valley Sandstone of East Texas. “The light sand fracs were originally done out of a need to get the economics in line (gas prices were at historic lows) rather than research,” says Bill Grieser. 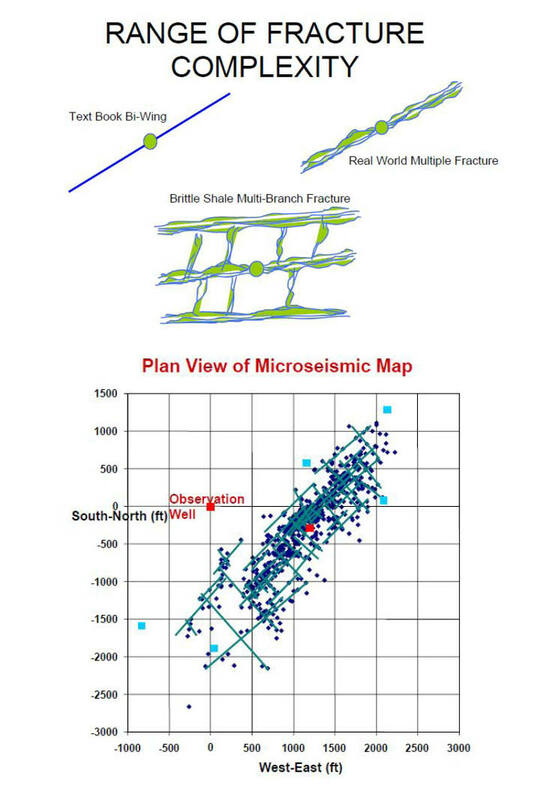 Microseismic mapping (explained later in this article) indicated that the LSF outperformed the conventional gel frac. system. Refracs of older producing wells also proved worthwhile in enhancing production and have become routine. Horizontal drilling started in earnest in 2002 after Devon Energy acquired Mitchell. About 1500 horizontal wells will be drilled this year alone. These wells increased production twofold, slowed decline rates, and extended the play beyond the core producing area. This core area has the Marble Falls Limestone as an upper frac barrier and the Viola Limestone for the lower frac barrier. Outside the core area, the Viola Limestone pinches out to the west and southwest. In the areas where the Viola is absent, vertical wells have had limited success because many have frac’d into the underlying Ellenburger, opening a conduit for water production. Horizontal drilling technology, combined with area specific frac treatments, have mitigated this problem and expanded the play into previously non-commercial areas. Top: Fractures like the complex example pictured here are the type that occur in the Barnett Shale. 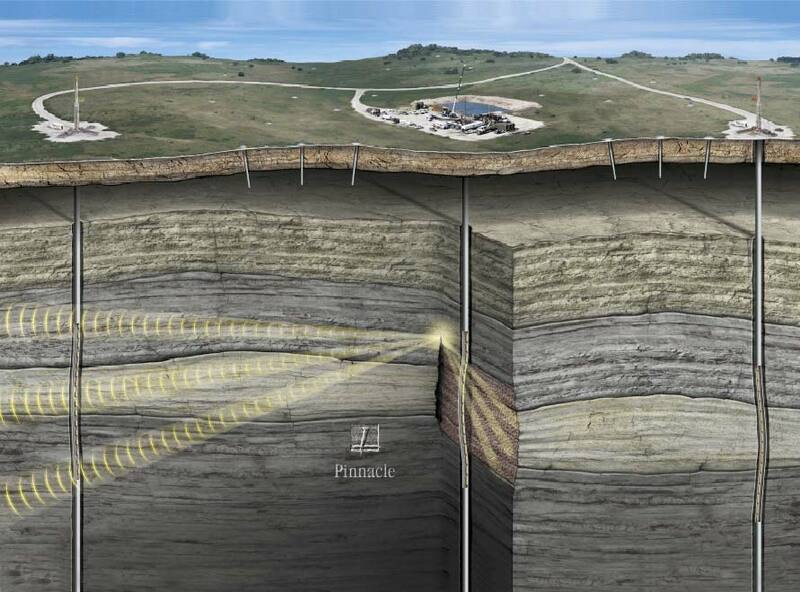 Bottom: Using a combination of surface tiltmeters and downhole geophones (see illustration on page 50), microseismic mapping has helped define the effectiveness of hydraulic-fracturing in the Barnett and refined the technology. Image source: Halliburton. The classical description of a hydraulic fracture is a single bi-wing planar crack with the well bore at the center. However, evidence gathered from microseismic mapping indicates that fractures in the real world are almost never that simple. Mapping has proven that a fracture treatment in the Barnett can be very complex. Fracture mapping technologies can provide insight into reservoir depletion dynamics and significantly help optimize reservoir management. Generalized cross section for the Fort Worth Basin. Illustration: Richard Pollastro, USGS. At first glance, the Barnett Shale may seem simple in terms of structural and stratigraphic complexity. However, geoscientists and engineers have gone to great lengths to understand the geology and geochemistry and their impact on successful production from the interval. Geological factors affecting ultimate reserves are the maturation pattern throughout the basin, regional faulting, underlying Ellenburger karsting and the thickness of the Barnett in the prospective area. Drilling, fracture stimulation techniques and completion strategy must be designed to match the needs of a given area. The Barnett Shale is an organic-rich marine shelf deposit of Mississippian (Lower Carboniferous) age. It unconformably overlies the Ordovician Viola Limestone-Ellenburger Group and is conformably overlain by the Pennsylvanian Marble Falls Limestone. In the Fort Worth Basin, the Barnett ranges from 60 m thick in the southwest portion of the Fort Worth Basin to 300 m in the northeast portion. The core field area averages 150 m in thickness. Composition is 2-8% organics, 20-30% clay minerals (illite), 45-55% silt (quartz and feldspar), and 15-19% carbonates (calcite and dolomite). It is also characterized by extremely low permeability, ranging from 0.000009 to 0.005 mD and 3.5% average porosity. Wells drilled on or near faults tend to have high fracture gradients. Near major tectonic faults, water production is a problem when well stimulation fractures migrate toward the fault and into communication with Viola or Ellenburger water. Another problem that results in poor frac treatments is karsting in the Ellenburger creating faulted chimneys up through the Barnett. 3-D seismic surveys image those areas that should be avoided with current stimulation procedures and when that is not possible, cemented off. Surface tiltmeter arrays measure surface deformation. The downhole tiltmeters measure deformation patterns in adjacent well bores. Sensitive geophones measure micro-earthquakes caused by the fracture treatment. Photo credit: Kevin Fisher, Pinnacle Technologies. Organic rich shales have always been looked at as source rocks. Under the right conditions, oil and gas can be generated from these shales and migrates over time into reservoir rocks. Every petroleum system owes its existence to the presence of source rocks and now many of these source rocks are becoming productive reservoirs. Thanks to the successes in the Barnett, the production and inventory of shale gas is growing in leaps and bounds. 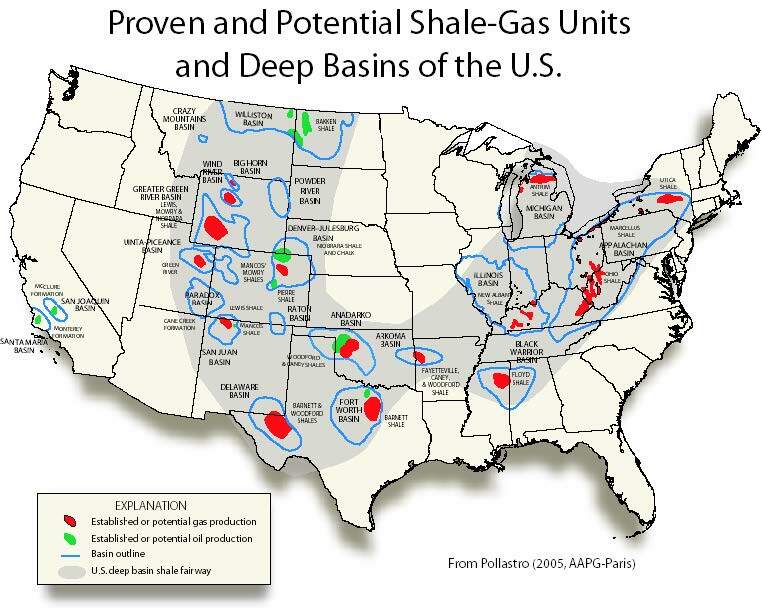 “Just about every oil company has a potential shale reservoir. We are now seeing rapid expansion of shale gas production into Oklahoma, Arkansas, and Alabama,” says Bill Grieser of Halliburton. Special thanks to Bill Grieser and Katy Eichelberger of Halliburton, Kevin Fisher of Pinnacle Technology, Dan Steward of Republic Energy, and Richard Pollastro of the USGS. Shale gas production has been around for a long time, in fact, the first commercial well was drilled in New York in the late 1820’s. By 1926, the Devonian shale gas fields in the Appalachian Basin were the world’s largest known occurrence of natural gas. These shales extend from southwestern New York south to eastern Kentucky and central Tennessee with the largest fields found in Kentucky and West Virginia. hale gas reservoirs store natural gas as free gas within the rock pores and natural fractures, and as absorbed gas on organic material. The speed and ultimate gas production is affected by these storage systems. The challenge in exploring shale gas plays is in obtaining economic production rates. Because shales are typically low to very low in permeability, fracture systems that exist naturally or are induced within the reservoir are necessary to sustain gas production. Some type of stimulation is required to get most wells to produce in commercial rates. The real upside of shale gas plays are long-lived reserves and high success rates with attractive finding costs. New stimulation technologies will continue to expand the productive limits of historic play areas and add to the already impressive resource estimates. Thomas Smith takes us on a journey to one of the industry's largest, game changing shale gas discoveries. Almost all Danish oil and gas comes from the Central Graben. Nevertheless, there is still some interest in other areas, including the onshore.